The horses and ponies who stay at our farm enjoy a staff that just loves horses and gives each horse lots of love and attention. 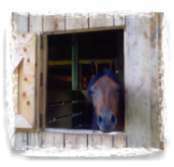 We offer 3 pastures, an outdoor ring and lots of wooded trails. At this time we are only offering board in combination with training, instruction or breeding.